Difference between revisions of "Yuuki Terumi"
Terumi first appeared as an NPC in ''[[BlazBlue: Calamity Trigger]]'' while he possessed [[Hazama]]. It was not until ''[[BlazBlue: Chrono Phantasma]]'' that he finally became playable as an independent character. "Small fry live as small fry do... struggling." Yuuki Terumi (ユウキ＝テルミ), in reality the God Susano'o, is the main antagonist of the BlazBlue series. He is a cruel spirit who lusts for the destruction of everything he touches, relentlessly murdering and torturing those who cross him. He founded both the Novus Orbis Librarium and Sector Seven and was responsible for the incident that ruins Ragna's life. 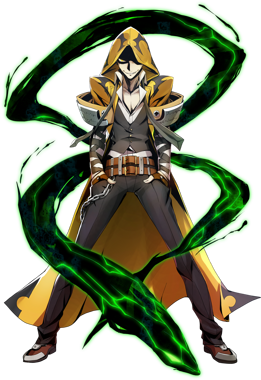 Terumi first appeared as an NPC in BlazBlue: Calamity Trigger while he possessed Hazama. It was not until BlazBlue: Chrono Phantasma that he finally became playable as an independent character. Physically, Terumi's human form looks nearly identical to Hazama, with some notable differences — his hair stands straight up and his snakelike eyes are open. 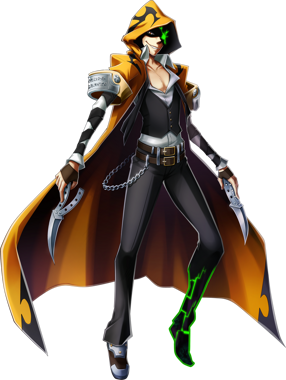 Most of Terumi's clothing in his human form is identical to Hazama's, but, in place of Hazama's black coat and fedora, Terumi wears a long, hooded yellow cloak covered in black markings. The short sleeves of his cloak are large and have engraved metal plates attached to them. Terumi also wears his tie untied. On the right side of Terumi's torso are three large scars; remnants of a wound sustained in his battle against Tomonori. Terumi's “ghost form” is a simple black-and-green humanoid shape with long arms, a glowing green spot on his chest, and a face consisting of a wide smile and a single red eye. During his Astral Heat, Terumi's ghost form transforms to resemble Susano'o. In the BlazBlue: Phase Shift series, Terumi wears similar clothing to his human form in the main BlazBlue series, except instead of Hazama's suit, he wears Kazuma's uniform. He seems impulsive and shallow-sighted, but is actually crafty and clear-minded. Cold and cruel, he truly enjoys "despair" and "destruction" from the bottom of his heart. Terumi has been described as "absolute evil", with "no margin for sympathy". He is an amoral, sadistic psychopath who lives for nothing more than causing suffering for others and experiencing the joy doing so gives him. Due to his nature as a god, he sees himself as superior to humans, viewing them like insects which he can “play” with for his own sick pleasure. He gives off the impression acting suddenly and without forethought, but in truth, Terumi is a master manipulator skilled at playing a long game to achieve his goals. He is effective at tricking and lying to people and has manipulated multiple organizations into playing a part in his schemes. Ultimately, Terumi desires nothing more than the destruction of everything his “sister” Amaterasu has created, and wishes to create a new world in his image, full of despair and suffering. Although he has a slender frame, Terumi is absurdly powerful, owing to his status as a God. His physical strength is matched only by his strength in the Arts as he has a complete mastery over Ars Magus and abilities lying in sorcery. He can freely move his soul between vessels, possessing them and lurking in their shadows of their minds. Related to this ability is Terumi's status as an Observer who is a special case - he can Observe himself. This is a technique that is said to be crude, but it allows the user to solidify their existence and remain rooted in existence; Terumi used this against Hakumen's Time Killer technique and survived when it should have killed him. Terumi has several weapons, the most notable being the Nox Nyctores - Geminus Anguium: Ouroboros. Despite being the wielder of this weapon, it is not often that he chooses to use it. Ensnaring opponents, attacking from a distance or messing with the victims emotions are some abilities that the Nox grants. Terumi instead favors his twin balisong knives in combat, often getting into the thick of a fight and using them in vicious slashing motions. One of Terumi's many abilities is called Mind Eater, which functions differently to the Mind Eater (Maledictus Plaga) and Mind Eater (Opprimo Vinculum), but he is capable of using the latter. Terumi's Mind Eater instead eats away at the memories of the target, taking them away and supposedly placing them into the Boundary. Another ability he passively employs is amplifying his strength according to the hatred that others direct at him - the more intense the hatred, the more powerful Terumi becomes. In gameplay, Terumi's Drive is Force Eater, which functions similarly to Ragna's Soul Eater. Instead of eating the opponent's lifebar, Terumi's Drive grants him copious amounts of Heat upon a successful hit, and to reflect this, most of his moves are Distortion Drives. One in particular, the Serpent's Cursed Sting, will drain the opponent of their Heat to help fuel the move in question. Terumi's playstyle reflect his personality and relies heavily on pressuring the opponent with the advantages given by his high Heat. As well as his overwhelming power, Terumi is supremely intelligent and was partially responsible for the creation of Ars Magus as a whole - had it not been for his assistance, Nine the Phantom would have failed to create the Art in one year during the Dark War. Terumi's speciality concerns seithr and the Boundary, but he is also, understandably, the most well informed on the Sankishin. Terumi's intelligence goes further than this as he is a master manipulator who's cunning plagued the background of both the Dark War and Ikaruga Civil War. Terumi has a handful of specific weaknesses and is invincible otherwise. He requires a vessel to inhabit since he can only Observe himself for so long when the need arises. He is also weak to the Hihiirokane, a blade that can cut souls, and it is the only weapon that can truly hurt him. Terumi's final weakness is that since he relies on hatred to fuel his strength, there have been times where he has been overpowered by others because they have controlled their feelings towards him, such as Kokonoe. Once one of the Six Heroes who defeated the Black Beast, as well as the one who plunged Ragna into despair, he may seem impulsive and shallow-sighted, but is actually quite crafty and clear-minded. Cold and cruel, he truly enjoys "despair" and "destruction" from the bottom of his heart, and starts the Imperator's even worse "banquet of madness." One of the Six Heroes that defeated the Black Beast, and the true identity behind the man who occupies Hazama. Incidentally, he also created the Azure Grimoire, which is what caused the Black Beast's appearance. He attacked the church where Ragna, Jin and Saya sought refuge, and gravely wounds Ragna in the process. He kills the Sister, and takes Jin and Saya with him, throwing Ragna into a pit of despair. He might look like a nutcase form the outside, but there is a meaning behind his actions and he is quite clever. We are dealing with a man who simply lives for the destruction and screams of his victims. During the Dark War, he loses his flesh upon the revival of the Black Beast but is then able to conceal himself in the body of Kazuma Kval, thanks to Relius's careful tactics. After being restrained by Valkenhayn, he is confined inside the Alucard Manor. But is freed when the Black Beast runs rampant by the hands of Nine, who regards his knowledge to high standards. He is kept under control of her spell. With his cunning and ability to manipulate people, Terumi pulls the strings from behind the curtains, aiding in the establishment of both the NOL and Sector Seven. Furthermore, he kills or nullifies half of the Six Heroes with his own hands. He is sealed away only at the hands of Jubei and Hakumen…combined. Currently, Takamagahara's system allows him to exist in the human realm, albeit only mentally. After, he forces Noel, who now has the Eyes of the Azure, to acknowledge his presence, binding his exsistance into the realm as we know it. He has revived, completely. Since, he still uses Hazama's body, and carries out his missions alongside Relius and the Imperator. But, he is once more torn by Trinity's mental attack using Muchorin's powers. One of the Six Heroes who was active during the Dark War. He's a far cry from what you'd call a hero, bearing a calmly cruel personality and a heartfelt enjoyment of destructive actions. He seems like the sort to jump the gun, but is actually unnaturally sharp and cunning. The mobile game Mabinogi Duel stars Terumi as a playable card. In the BlazBlue 10th Anniversary Character Poll, Terumi placed 4th out of the 84 candidates. He scored one place above Jin Kisaragi and one place below Hibiki Kohaku. He had 4,644 votes. Terumi's birthday is Leap Day. The majority of Terumi's movelist references snakes. In gameplay, Terumi's sprite has a forked tongue. Terumi's spirit form is visible when hit by Jubei's Astral Heat. This spirit is also visible if it is used against Hazama or Susano'o. In an interview with series creator Toshimichi Mori in the BlazBlue: Central Fiction Official Setting Material Collection, he describes having designed Terumi to be absolutely evil without exception. This would leave no room for sympathy. Terumi is the fourth DLC character in the franchise, being the first introduced for BlazBlue: Chrono Phantasma. Despite having the last name "Terumi", he has no relation to the Amanohokosaka Clan. "Yuuki Terumi" is only an alias, although why he uses it is unknown. Whenever Terumi would take control of Hazama, his hair would spike up; his eyes would open,; his shirt would slightly unbutton; and he would talk in a completely different tone. The body used by Terumi after splitting from Hazama during Chrono Phantasma was materalized by Trinity Glassfille. The one he uses during BlazBlue: Central Fiction is one created through Observing himself. In Chrono Phantasma's Abyss Mode, Terumi may sometimes stomp on his opponent after a match. The game counts these hits as combos, and they will be added to the calculation for player progression in the mode.